Microsoft has announced the release of Visual Studio 2019 Preview 1 at the Connect 2018 event. This preview highlights many changes, from the IDE's startup behavior, to code refactoring functionality, and greater use of search functions to better navigate larger projects. This preview showcases Microsoft's efforts to get developers working on their projects quicker. Microsoft has added a new launch screen that appears at application startup. The goal of this screen is to make it quicker to immediately open a recent project or to clone/check out an application hosted on Git. It is possible to simply press ESC to close this window and proceed with the loading of the IDE. Customizing the behavior of this is possible under Options | Environment | Preview Features which provides an option to permanently enable/disable this window. Another sign of the expediency push is the revamp of the Quick Launch box (hotkey CTRL Q). The search capability of the IDE has been improved to support fuzzy string searching and additionally will search across IDE settings, commands, and options. This was demonstrated by showing the results of a search for the misspelled word "cdoe" in VS2017 (where nothing was found) versus VS2019 Preview which searched on the assumption the user meant "code". 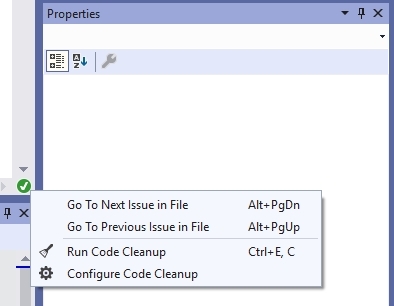 Code refactorings have been expanded in VS2019, with the editor identifying common scenarios where code implementation can be improved. Examples of this new behavior include changing for-loops to LINQ queries or converting tuples to named structs. It is important to note that these recommendations are optional and taking the advice of the IDE is up to the developer. It should be noted that Microsoft says this design is not final and may change over the course of development. A search bar has been added to the Autos / Locals / Watch windows shown in the debugger. Search depth can be configured in an effort to keep the feature useful without burdening the user with too much information to wade through. Interestingly, the current iteration of the IDE does provide ways to customize the behavior of other aspects of the user interface (the aforementioned startup window, and whether or not to use the new compact menu and search bar). To obtain Visual Studio 2019 Preview 1, it is necessary to download a new copy of the Visual Studio Installer. Once this is run it is able to manage installations of VS2017 as well as VS2019 Preview. how to disable telemetry and actually install community edition! I found this article interesting because when I had a play around with this preview yesterday, I asked about how to re-enable the title bar on Stack overflow ( stackoverflow.com/questions/53636350/re-enable-... ). I too found that you could only re-enable it via the the preview features section in the options menu.